Saturday; Saturday was our first day in weeks that we didn't have that much on (we still had a birthday party, a chiro appointment and some errands to run - but compared to usual that was nothing) so we actually had a reaaaaaaaaaaaalllllllly lazy dinner. I had oatmeal with blueberries and peanut butter (with a side of carrot and cucumber sticks because I'm weird and felt like vegetables too) and Jesse had a sandwich :P Keeping it real! 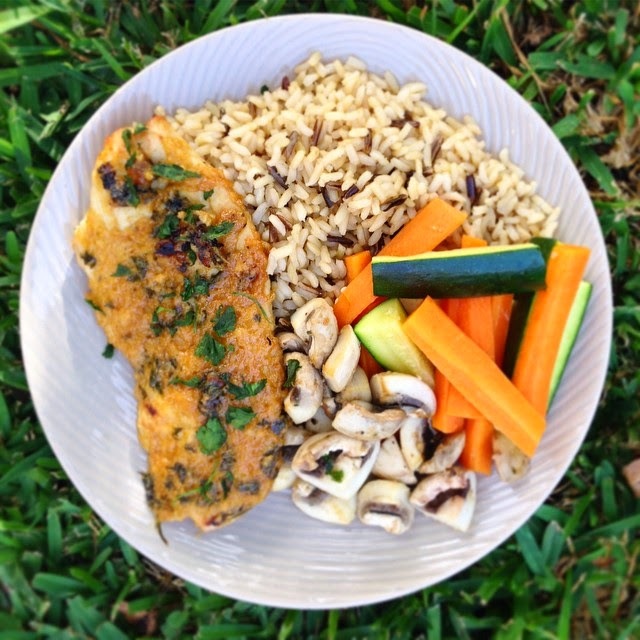 Monday; On Monday night we tried something new - Maple Dijon Baked Chicken Breasts - something different but really delicious! Definitely got to make that again sometime soon! Tuesday; On tuesday we had the pumpkin mac and cheese with bacon you can see above. 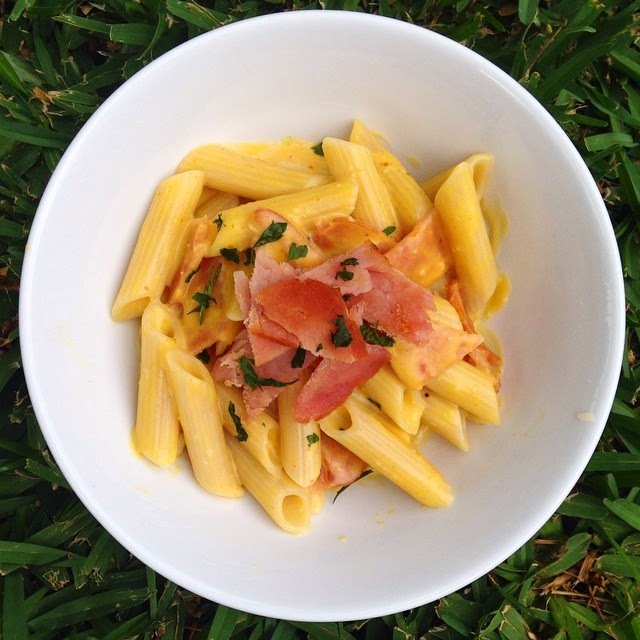 This is one of Jesse's favourite pasta recipes (in fact, he calls it the best mac and cheese) but he never knew until this week that it contained pumpkin - and that was only because I spilled the beans! Wednesday; On Wednesday night I was really sick (we think it was potentially cross contamination from the coffee I had earlier in the day at a cafe) and I didn't feel like much in the way of "dinner foods" so I had some steamed rice with cheese and avocado with some hummus and veggie sticks on the side. Thursday; Last night I was cooking just for me and decided to have this Avocado Pasta with added grilled chicken breast and mushrooms - served up with a side salad. Ugly looking but so so delicious! Tonight; Tonight I'm cooking just for myself (unless Jesse gets home from Canberra earlier than expected) so I have no idea what I'm going to have. It's got to be something quick and filling before I rush off to Ignite for the night! 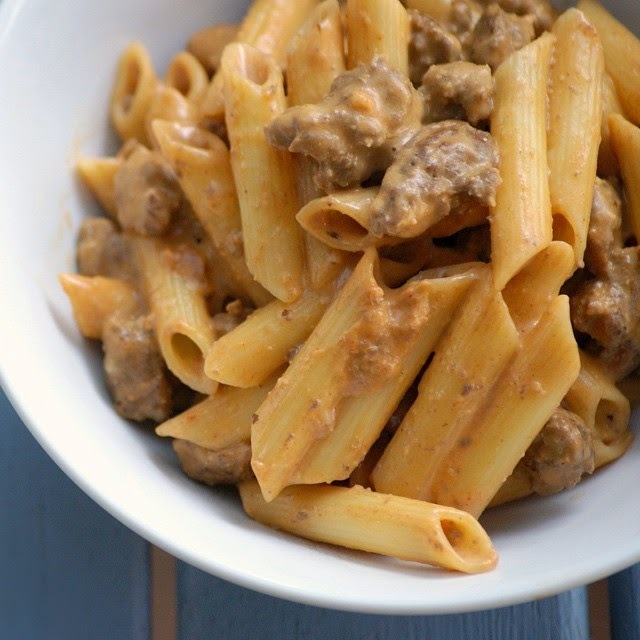 Perhaps our Healthy Hamburger Helper Copycat Pasta Recipe will be on the menu! Recent Breakfast Faves: Usually I stick to breakfast bakes for breakfast as they're quick, easy and delicious, however, this morning I had some extra time (as Jesse wasn't home so I didn't have to make him breakfast or lunch) and didn't have any meetings scheduled for this morning so I decided to take that extra time and use it to make myself pancakes for breakfast! 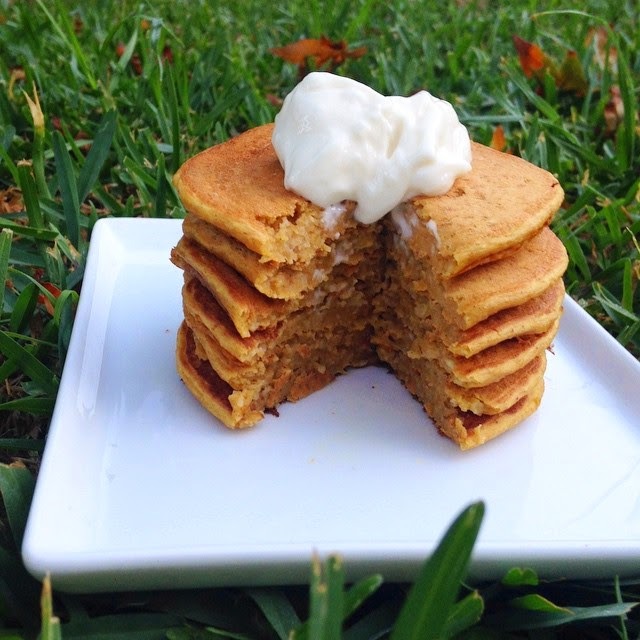 Pumpkin Protein Pancakes, topped with cream cheese and maple syrup - to be precise! 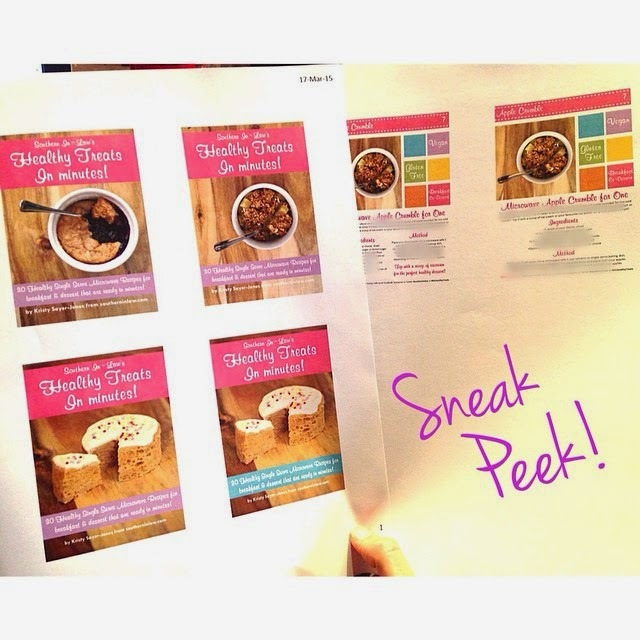 Recent Busy-ness: I've been busily working away on our Healthy Single Serve Microwave Recipe eBook - which we're planning on calling Healthy Treats in Minutes - and I am so so excited to finish this project off and share it with you! There are 30+ different recipes with everything from blueberry cobblers to chocolate chip cookies, lava cakes and everything in-between! Recent Obsession: (which nearly killed me) Almond Milk Lattes. 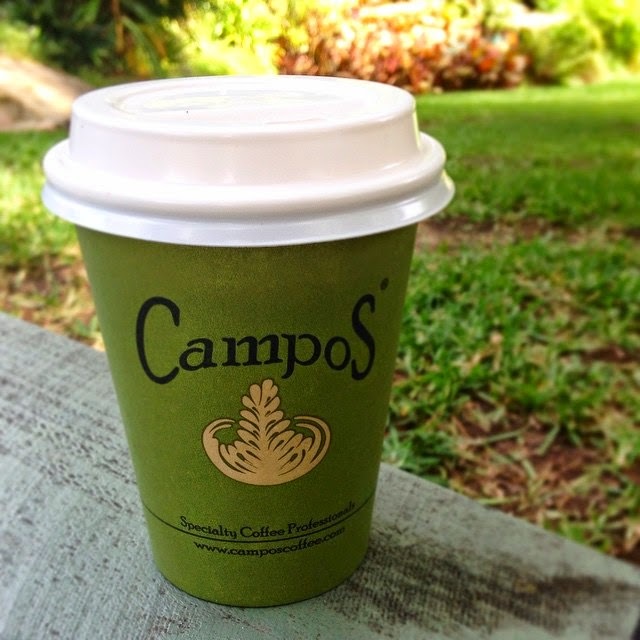 Usually I make them home, however, when a local cafe switched over to Campos coffee this week and I knew they had the new Almond Breeze Barista blend I decided to take a risk and give it a try. Apparently my body didn't agree with said risk as I felt awful that afternoon/evening. I'm not sure if it was the coffee (potentially cross contamination or the barista blend having something not Kristy friendly) or something else but I guess I may have to try it again to find out. Recent Joy: We got a letter from our sponsor child, Tumpa, in Bangladesh and I was so overjoyed to read that she wrote she wants to be a Worship Leader when she gets older! Compassion are an incredible organisation who bring the gospel to children all around the world who so desperately need it - and we are so thankful that Tumpa gets to know Jesus and His incredible love for her! 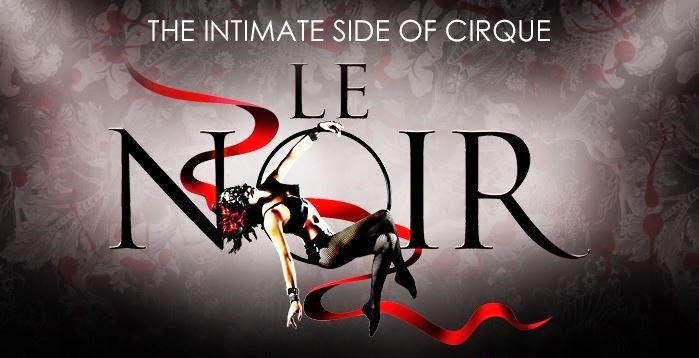 Recent Plans: We're off to see Cirque's Le Noir tomorrow night at the Lyric Theatre and I cannot wait! I'll definitely be sure to share our thoughts on Sunday in our 6SS post! We're also planning on heading to the Farmer's Market tomorrow morning with some friends and finishing off the weekend with church and some crafting for projects we've got planned for the blog! Anthing exciting happen - or do you have exciting weekend plans? What's the best thing you've eaten/drank this week? The best thing we've eaten this week? Probably that pumpkin mac and cheese - I seriously need to share the recipe with you all ASAP! Oh myyy that pumpkin mac and cheese looks insanely good!!!! That is soooo genius...adding pumpkin to lighten up and cream-y (??) up a pasta dish. :D Reminds me of butternut squash pasta, so good! And I'm glad you two are reunited again!!! Sometimes even when Greg is away for one night I start to feel kind of funny, but it's not so bad either because you get total alone time when baby sleeps, hehe ^_^v Hope you have a beautiful day, love! 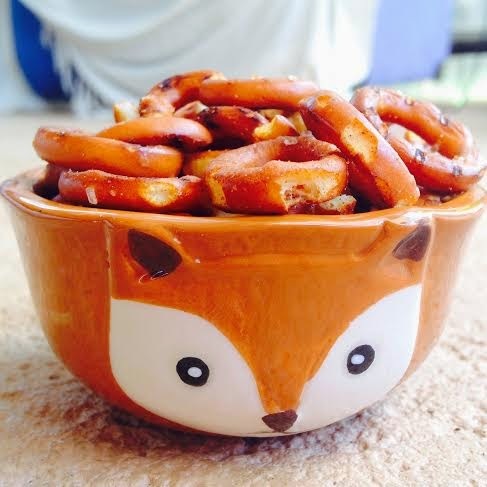 The fox bowl! <3 Adorable! Haha, it's my absolute FAVE! It is so so good and the pumpkin makes the sauce deliciously creamy and rich whilst still lightened up and healthy! Butternut squash is actually called butternut pumpkin in Australia (as it's more of a pumpkin than a squash in terms of texture/flavour!) so it definitely works in this!